An aromatic cup of coffee with a hint of smooth and sweet mocha chocolate stirred in is such a wonderful treat any time of the day. 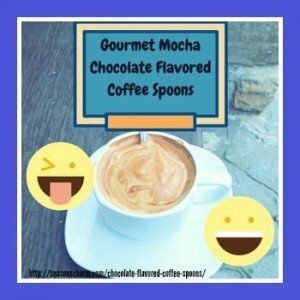 The gourmet mocha chocolate flavored coffee spoons gift box by Seattle Gourmet Foods is such a wonderful tasty gift whether for housewarming parties, birthdays, weddings, baby showers or coffee lovers. The gift box set comes with 24 golden colored individually wrapped mocha flavored coffee spoons with 0.6 oz flavoring per spoon. Individually wrapped gourmet flavored mocha coffee spoons preserve freshness and look presentable with a lovely label. Whether stirred into hot chocolate, coffee or tea, it adds a nice elegant touch and a delicious flavor. Your morning cup of cappuccino will be even more delicious when stirred with these gourmet chocolate spoons. With these gourmet chocolate dipped coffee spoons, it is so convenient and simple to make a cup of delicious tasty coffee just like those served at high end cafes. Chocolate covered spoons for coffee or tea make a great thoughtful gift for all occasions. These also make a great tasty treat for your own self. 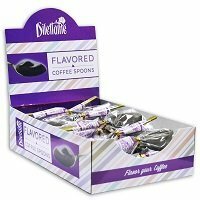 The gourmet mocha chocolate flavored coffee spoons gift box make an excellent and inexpensive gift for housewarming.